Pauline & Peter from the Lismore Community Garden, one of the stallholders. Casie and Alex one of the performers in the “Lismore Thursday Produce Market”. What is exciting? Or maybe interesting? Hmmnn.......... let me think. Aha! got it. It is the Lismore Thursday Pro­duce Market, of course. The Market goes every Thursday, Magellan Street from 3:30-7:30pm. Well, well, well, what is in there? 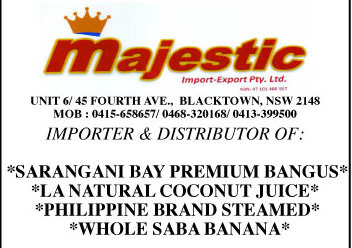 A range of fresh local produce of fruits and vegetables, fresh Yamba prawns and fishes of various kinds. The fresh produce of fruits and veggies are locally grown by local growers and sold direct to the consumers. The flavours of freshly ground coffee, cakes, breads are on the lists too. Wow! what a variety to choose from. The place also becomes the meeting place of people from all walks of life. What is more exciting is the live entertainment from various singing artists each week. Music that is soothing to the soul and if anybody wants to drop a gold coin or two, it is most welcome. And if anybody wants to give more, I think the better. Or by just listening and clapping hands to show an appreciation after the show. People shops for their foods, or just hang around and enjoy the cosy atmosphere. An Indonesian meal is also available at a very fair price. Or you can just sit back and relax and enjoy life free from stress and think of nothing else. A statement that says, “Do not talk to strangers”, I think does not apply in this environ­ment as everyone gives a smile to the people around. Like myself for instance, I just love talking to people even strangers and enjoy a good chat. Surprisingly, there are people from Europe or other States of Australian who are having their holiday Lismore. Lismore people are friendly and fun loving. Mayor Jenny Dowell is a local supporter of the Lis­more Thursday Produce Market. Would see her with her big basket full of produce and stops around and talk to people. Good on you, Jenny! We are so proud of you! One of the funny things we did (with Mathel and Vicky - my friends), is at times sing with our singing artist friend Wendy like we are her side kicks. What a fun! Truly it is. At times, people are asking about how to cook the Asian vegetables or the Thai eggplant. There is no limit in cooking as everybody can do anything - just use your wild imagina­tions. But they appreciated the simple tips. Encouraging everybody to support the local businesses - it is helping our local producers and the local economy.